Robocoin, a popular bitcoin ATM provider, is announcing that they’re upgrading all of their ATMs to turn them into full service “banks” complete with account control, payment systems, and a method for handling multiple wallets. Now customers can store, access, and send bitcoins wherever there is a Robocoin Branch, with just their #PhonePinPalm. Customers can now send bitcoin to a phone number–disruptive potential on the remittance industry. No more bitcoin wallets, QR codes, public/private keys, or waiting for block chain confirmations to get your bitcoins and cash. Bitcoin sent in the Robocoin network is transferred instantly–no confirmations required. Customer’s palms are their password–trust that bitcoins are biometrically secured with the best password in the world, their palms. Also take comfort in 100% proveable reserves. What does this really mean in practice? Well, first the language around bitcoin access will change from wallets and transfers to accounts and deposits/withdrawals, thereby reducing some of the fright factor of standard BTC systems. 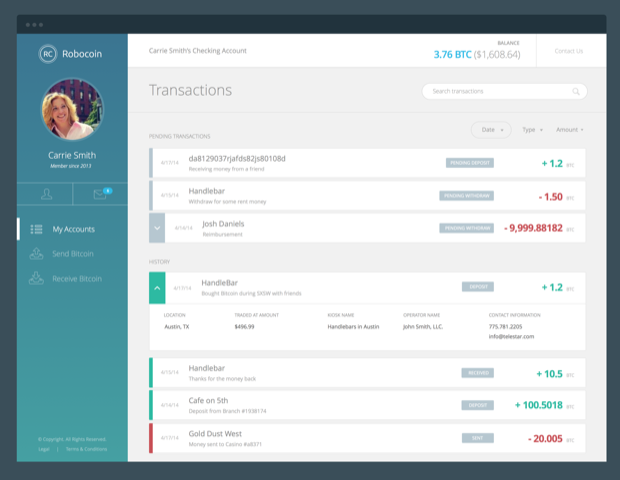 Because you will be able to control multiple wallets (now called accounts) you can create one for a point of sale system, one for savings, one for checking, etc. It’s a perception thing that will improve adoption. Given that the nearest Robocoin kiosk to me is currently in Texas I doubt I’ll be hopping up to slap my palm on an ATM. However, it’s an interesting move that could legitimize the platform for many bank users.